Have you seen this book by Kathleen Tracy? I didn't know when I purchased the book, but it is from the same author of the Civil War Sewing Circle & Prairie Children and their Quilts! No wonder I love it! I needed a new hand applique project to keep me out of trouble occupied! As I type this post, I have 22 made! Forty two (42) more to go! Penelope and I have had a couple of play dates! I'm looking forward to showing you some finished hand applique quilts! 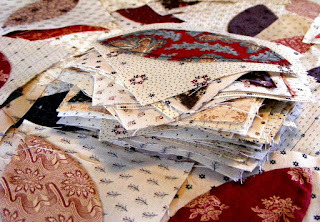 I have long admired this quilt...I will really enjoy seeing your progress!! That looks like a fun project! I have the book - I should start making one too! That is going to be gorgeous with those fabrics. What an interesting looking book. I will have to be on the lookout for that one. How big will this quilt be? It will be beautiful.